In 2013, Zhang Kaiqin, Wu Dan, Liu He, Lei Sheng, and I opened Handshake 302, an independent art space located in a 12.5-square-metre efficiency apartment in Baishizhou—Shenzhen’s most iconic urban village. The space functions as a gallery or an apartment, depending on the needs of the collaborating artists. Over the past five years, we have created and curated site-responsive art that grapples with the city’s uneasy negotiation between the formal and the informal, the urban and the rural, the emergent and the vanishing, as well as the anxieties that the city’s success has generated. Our decision to open an art space in Baishizhou was made in the context of the ongoing demolition of Shenzhen’s urban villages and the forced relocation of their residents. In this essay, I introduce several artworks that present Baishizhou, its post worker demographics, and the emergence of Shenzhen as a ‘creative’ city. Handshake buildings and the narrow alleys in between comprise the defining architectural features of an ‘urban village’ (chengzhongcun)—Shenzhen’s informal but not disorganised working class neighbourhoods. Built by village collectives in the 1990s, Shenzhen’s urban villages continue to evoke the city’s rural origins, its status as ‘China’s first city without villages’ notwithstanding. These brutal tenements are called ‘handshakes’ (woshoulou) because it is possible to reach from one’s window across a narrow alleyway and shake hands with a neighbour. 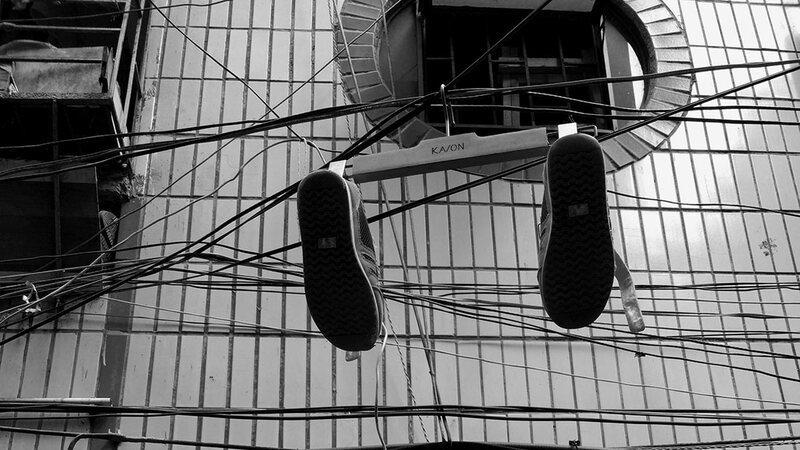 Not that anyone actually reaches into the alleys, except to hang laundry on the innumerable electrical wires connecting Baishizhou’s 2,340 buildings and estimated 35,000 rental units. The official Baishizhou footprint occupies roughly 0.73 square kilometres. Overseas Chinese Town (OCT) abuts its northern, southern, and eastern borders, and the Shahe Golf Club lies next to its western edge. Internally, vernacular Baishizhou comprises six sections that point to the neighbourhood’s history—the Shahe Industrial Park and the five villages—Baishizhou, Shangbaishi, Xiabaishi, Xintang, and Tangtou. Their administrative integration is an artefact of collectivisation. In 1959, the villages were designated Shahe Farm, a provincial-level outpost of the Guangming Overseas Chinese Dairy in northern Shenzhen. Four of the villages are located north of Shennan Road, and the fifth—the actual Baishizhou village—is hidden away behind the Window of the World theme park, south of Shennan Road. Since at least 2012, the corporation that represents the five villages has been in negotiation with LVGEM, the appointed real estate company, over compensation for demolishing village-held properties. Roughly a decade ago, Shenzhen began to squeeze manufacturing out of its borders—first from the Special Economic Zone (SEZ) and then from its outer districts. They squeezed out textiles, electronics, and toy factories like ‘toothpaste from a tube’, as a friend once described it to me. When Shahe’s eastern factories were demolished in 2016, they were already being used for storage and as transfer stations in the online economy. The surviving factories in the eastern section of the industrial park were gentrified into restaurants, cheap studio space, and even microbreweries. Today, as Baishizhou hovers at the edge of annihilation, it has an estimated population of 140,000 people, although like many other Shenzhen statistics, this number disintegrates upon inspection. Does it include the roughly 1,800 members of the historic villages? The former workers and staff of Shahe Industrial Park? Residents of the housing developments that are only accessible from Baishizhou, but technically not built on the Baishizhou footprint? Or does it represent the registered population in the four community stations (shequ gongzuozhan) through which ‘Baishizhou’ is administered? Like much in Baishizhou, demographic figures operate as placeholders for information we believe should be on record, but somehow hovers just beyond confirmation. During her residency at Handshake 302, second generation Shenzhen migrant Zheng Kuai photographed a pair of athletic trainers that had been hung out to dry. The trainers dangle above accumulated grime and dank gutters and, like Van Gogh’s Shoes (1886), point to the contemporary organisation of labour and its shifting topographies. In homage to Heidegger’s now famous interpretation of Van Gogh’s painting (Heidegger 2008), we might describe the toilsome tread of a rural migrant, who left his natal village wearing a t-shirt and blue jeans, cheap socks and synthetic shoes, carrying a middle-school diploma to pursue dreams of a better life. The shoes, we imagine, became soiled and sweat stained in the walk from the tenement to his job. Did he wash the shoes himself or did the woman who cares for him do it? We wonder because the effort to clean the shoes points to care, to a gentle self-respect and the ambition to rise beyond one’s current status. But it is just as likely that he earns his wages in a job where cleanliness is mandatory. Several decades ago, when Shenzhen actually was the ‘factory of the world’, the migration that brought millions of rural workers to the SEZ was described as ‘washing feet and coming on land’ (xijiao shang’an)—a reference to the rice paddies where farmers worked barefoot. The expression is explicitly southern and coastal. Villagers from Shenzhen, for example, also used the expression to describe no longer having to work in the oyster industry, which had been central to the area’s pre-reform economy. Indeed, rural urbanisation in Shenzhen is easily imagined as post-mud. During the heyday of industrial manufacturing, when oyster fields, rice paddies, and lychee orchards were being transformed into a paved network of industrial parks, commercial centres, and housing estates, the city oozed and belched as construction sites pumped out thick cords of sludge. Today, however, teams of sanitation workers keep the sidewalks clean. The men wear trainers and formal shoes, the women wear high heals and shiny sandals, and all expect—and are expected—to keep their feet clean and dry. Shenzhen’s official history has figured the city as the male subject of a national bildungsroman. Located in the plaza of the Shenzhen history museum, for example, the public sculpture Path Breaking (1993) reinterprets the character chuang—which depicts a horse charging through a gate—as the creative spirit of China at the threshold of a new world. Chuang is a northern expression, evoking generations of workers leaving the country’s central plains to work in the northeast of China and Mongolia. Eyes fixed on the road before him, legs powerfully braced, arms flexed in anticipation, and fingers gripping the iron frame of the door that for too long isolated China from the world, the central figure of the statue embodies national will to power. Similarly, the statue of Deng Xiaoping on Lianhua Mountain represents the city through heroic masculinity, a leader confidently striding forward into the world (via Hong Kong). In contrast, projects completed at Handshake 302 have attempted to figure Baishizhou, its residents, and, more ambitiously, their urban agency and contributions. Consider, for example, Baishizhou Superhero one of the first installations at Handshake 302. In this oeuvre, Liu Wei’s playful cartoon characters transformed Handshake 302 into a magic telephone booth. Visitors stepped into the space and through the power of a photo stand-in became one of seven possible urban village superheroes—Methane Man, Wonder Granny, Stir Fry Fly, the Amazing Beer Babe, Village Guardian, Super Dog, or Cat-a-go-go. Friends could then take pictures of each other as they impersonated some of the most visible forms of labour in Baishizhou. At first glance, the installation seems a tacky party game until we remember that these jobs—deliveryman, child care provider, food hawker, beer waitress, and village fireman—constitute entry level access to Shenzhen’s post-manufacturing economy. 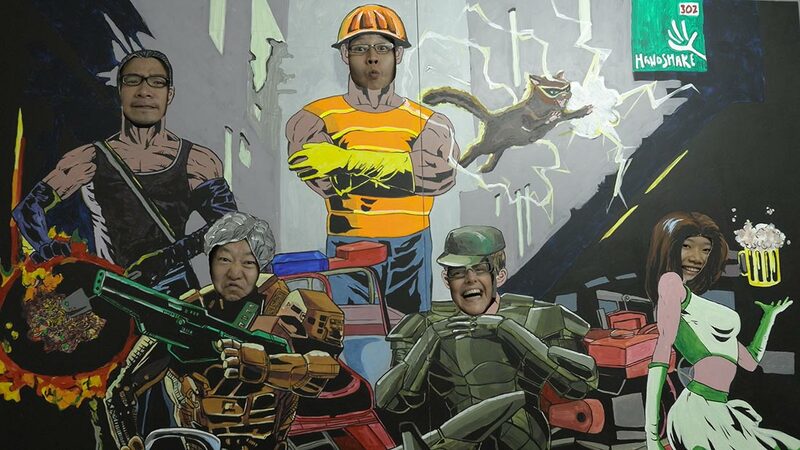 After all, these superheroes provide the services and social network that Shenzhen’s informal residents need to make themselves at home in a city which denies them the social welfare benefits concomitant with local household registration (hukou). In fact, the city’s demographics have shifted as quickly as its ever-changing mission statement precisely because it has structured its hukou to retain desired migrants and exclude people who are considered ‘temporary’. During the 1980s, for example, only transfers from an urban work unit (danwei) were granted the right to permanence through a Shenzhen hukou. Migrants with an official registration worked to build the city’s administrative apparatus as well as its infrastructure, while informal migrants worked in township and village industrial parks, engaged in quasi-legal commercial activities, or laboured on construction teams. In the 1990s, during the city’s boom, the majority of migrants came to work in the city’s informal economy. Professional migrants came to work as architects, designers, accountants, and lawyers, securing a Shenzhen hukou via state-owned enterprises, while the majority of migrants continued to labour without formal inclusion in the municipal apparatus. In this important sense, Shenzhen was always already post-worker, because workers were defined by their exclusion from the city. Workers lived in dormitories and urban villages, which were by definition transitional. When, in 2005, the city began restructuring from manufacturing to creative production, Shenzhen began attracting young creatives, even as factory workers were forced to leave the city or to change jobs, finding work in service or as small capital entrepreneurs. In 2016, then Municipal Party Secretary Ma Xingrui announced that the city’s administrative population had breached 20 million, but its hukou population remained less than 3.5 million. Thus, at a second glance, the insidious charm of Baishizhou Superhero becomes even more apparent. The Shenzhen Dream hinges on the fact that migrants come to the city in order to improve their material lives. Within the maelstrom of globalisation, however, the latent potential of human beings to transform themselves has been limited by the imperatives of commodification. The superpower of an unpaid grandmother, for example, is to create value by providing unpaid childcare so that both fathers and mothers can join the gendered labour force, as deliverymen or waitresses. The superpower of all Baishizhou migrants is, in fact, the power to sell their labour on an unregulated market for as long as their bodies hold out. A popular expression maintains that migrant workers ‘sell their youth’ (chumai qingchun). As individuals, there are limits to the scale of transformation. When a deliveryman’s legs can no longer pump a bicycle or when a waitress’ breasts succumb to gravity, these workers are replaced by younger, more energetic migrants. And there is the fantastic allure of the superhero myth—unlimited strength to endure and transcend physically exhausting and emotionally alienating jobs in order to realise oneself as a proper Shenzhener with a local hukou, propriety, and salaried job. After all, those who do not leave Baishizhou continue to exist in the liminal space between hometown and Shenzhen, their figure not yet determined. The rise of Shenzhen as a creative city has been a result of national-level planning decisions and municipal-level interpretations. By 2000, a mere twenty years into the reform era, the Chinese government had already recognised that many cities had ‘over-zoned’. Especially in the Pearl River Delta, competition within and between cities meant that industrial zones were no longer effective catalysts for modernisation. This was also true in Shenzhen, where low-end manufacturing of textiles and shoes—and artificial Christmas trees, plastics, and soap dishes—had already moved to neighbouring Dongguan. The new national strategy required that cities restructure their economies from assembly manufacturing to higher-value markets, including graphic design and high-quality printing, fashion and trade fairs, technology, research and design, biotech, and financial services. Today, creatives have joined the city’s transient population, living in urban villages to save money and time on their daily commute. The relationship between Baishizhou and the OCT illustrates the city’s ongoing transformation. In late 2005, for example, Shenzhen launched its restructuring with the Shenzhen Hong Kong Bi-City Biennale of Urbanism\Architecture (UABB) in the eastern industrial zone of OCT. Within several years of its establishment, the UABB had achieved international recognition and was generally acknowledged as Shenzhen’s most important cultural event, heralding the city’s ambitions to elevate its standing from a glorified industrial park to creative city. Shenzhen succeeded. Previously considered by many to be an over-ranked manufacturing town, it is now domestically acknowledged as China’s fourth city after Beijing, Shanghai, and Guangzhou. Outside China, Shenzhen has been represented as one of the country’s most important creative hubs. The goal of the UABB has since expanded to exploring urban possibility within the larger context of the Pearl River Delta mega cities and, more recently, China’s expansion into the South China Sea via the Belt and Road initiative. The OCT has not only symbolised Shenzhen’s rise as a creative city, but has also been deployed as a national model for post-industrial restructuring. In addition to the UABB, which the OCT hosted in 2005, 2007, and 2011, the area has attracted many of Shenzhen’s most important architecture firms, design studios, and cultural institutions to take up residence in its factory buildings, including the city’s leading independent modern art and design museums. While its theme parks seem dated, the OCT housing estates and starred hotels provide fantasy experiences, where staff dress as gondoliers, greeting guests with practiced smiles and offers of help. 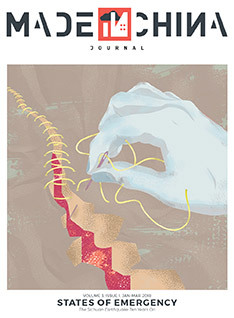 Nevertheless, the OCT model of creativity is not easily reproduced, primarily because its success has depended upon two factors: free land via the work unit system of development that prevailed in Shenzhen during the early 1980s; and shunting the cost of workers’ living expenses onto Baishizhou and other urban villages, a business practice which became prevalent in Shenzhen after Deng Xiaoping’s Southern Tour in 1992. On the one hand, the OCT was developed by a national ministry that did not have to pay for land. This came about as a result of the 1980 Sino-Vietnamese War. In 1980, the national government relocated roughly one hundred Sino-Vietnamese refugees to Shahe and Guangming, while other refugees were sent to cities and farms in Guangdong and Fujian Provinces. The daughter of one refugee mentioned that her parents had been jealous of relatives who had been settled outside Huizhou, which was ‘a real city’ and not ‘a rural backwater’ like Shenzhen. Based on the presence of these refugees, when Shenzhen intensified its modernisation efforts in 1985, the Ministry of Overseas Chinese Affairs was given 4.8 square kilometres of Shahe land to develop. The Ministry appointed Singaporean urban planner Meng Daqiang to consult on OCT’s overall plan, which emphasised a garden layout and the separation of manufacturing and residential areas. This plan proved beneficial. By 1990, it was clear that neither Shahe nor OCT industrial parks could compete with industrial parks in Luohu and Shekou, which were located next to the Port of Hong Kong and the Port of Shekou, respectively. Instead, OCT decided to use its location as a suburb to both Luohu and Shekou to develop theme parks and leisure areas for the city’s growing population and Hong Kong businessmen. On the other hand, in the early 1990s, Shenzhen pioneered the restructuring of socialist work units. In the Maoist system, urban danwei provided factory workers with housing, medical insurance, and education opportunities for their children. In contrast, in the 1980s, Shenzhen enterprises began hiring workers who did not have a local hukou, enabling factories to provide housing, medical insurance, and education opportunities only to a small percentage of workers. Most of these workers moved into handshake rentals, which, given the distribution of villages throughout the city, were located within proximity of any official development. The majority of young creatives who work in OCT, for example, live in Baishizhou until they can afford upscale rents or make the down-payment on a condominium. The ghosts of China’s violent inclusion in the modern world system haunt Shenzhen. One trips over colonial ghosts along Chong-Ying Street in eastern Shenzhen and rubs up against the ghosts of overseas Hakka throughout Longgang District. Ghosts have settled beneath the Yantian Reservoir when Tangtou Village was submerged so that the East River Waterworks could be constructed circa 1958, and they flit along the banks of the Shenzhen and Pearl Rivers, memories of those who drowned trying to swim from ‘Red China’ to the ‘Free World’ during the Cold War. 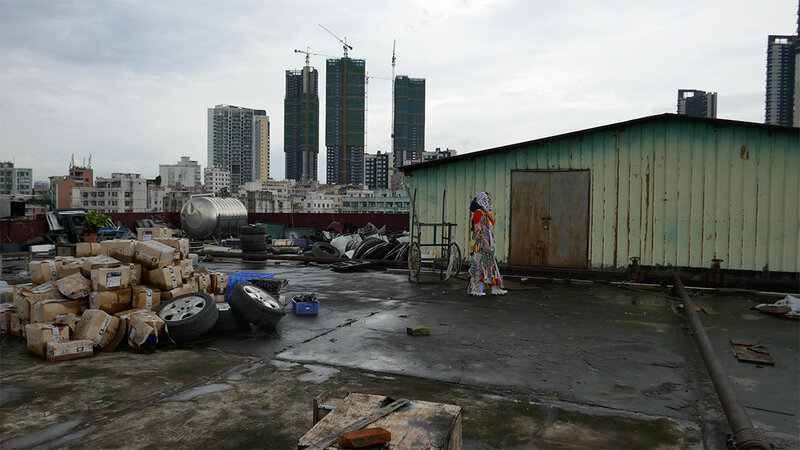 Maoist workers haunt the renovated factories of the Shekou Industrial Zone, and the ghosts of rural migrants manifest in the city’s demolished urban villages. Indeed, the uncanny presence of disappeared history has not only accompanied the city’s emergence as China’s fourth city, but also, and more importantly, defined it. These immanent hauntings also appear as ‘stages of development’ in normative accounts of the city’s post-Mao rise from a ‘fishing village’ to modern metropolis. In January 2018, no other place in Shenzhen materialised encapsulated the city’s ghastly topography as completely as Baishizhou, where it was still possible to find architectural traces of every era of the city’s modern history. In the northern section of Baishizhou, which does not consist of the actual Baishizhou village, but rather an amalgam of the Shahe Industrial Park Shangbaishi, Xiabaishi, Xintang, Tangtou, and gated communities, one could find freshwater wells that had been dug during the late Qing, an old munitions warehouse that was used during the war against Japan, and rural Hakka dormitories that were built in 1959 for Tangtou families displaced by the East River Waterworks project. There were two-story factories first built in the early 1980s, two-and-a-half family villas that were built in the late 1980s, and handshake buildings from the 1990s, as well as thousands of restaurants, mom and pop shops, and neon signage that have flourished as hundreds of thousands of people have used Baishizhou as their gateway to the Shenzhen dream. The ghosts that haunt Baishizhou also anticipate a seemingly inevitable future when the neighbourhood has been demolished and replaced with high-end housing estates, office complexes, and state-of-the-art cultural spaces. 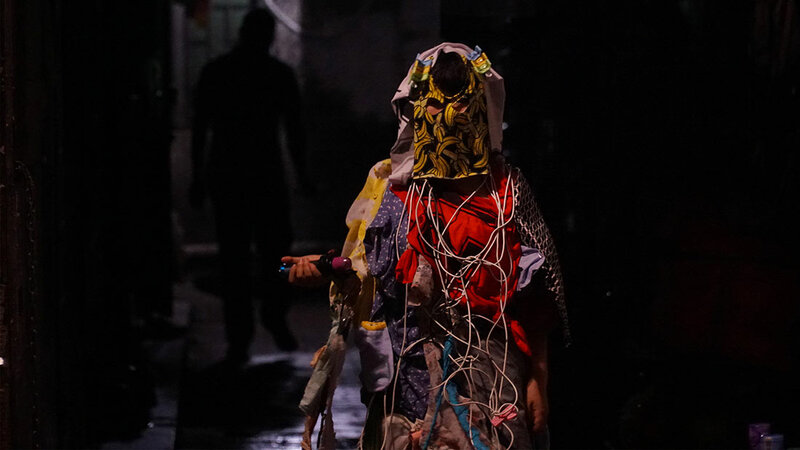 Handshake artist-in-residence, Sabrina Muzi constructed a shamanic cape and handheld props from objects that had been found or donated in Baishizhou, her artistic practice itself a reflection of the highly organised work of garbage collection, sorting, and resale that defines life in Baishizhou. She hired three people to perform as the spect, their identities distinguished by the objects in their hands—one carried a discarded control board, one carried a glowing staff, and one carried a small flashlight. The performers posed at and walked through several of Baishizhou’s representative spaces, including a market street, a restaurant, and the Baishizhou subway station. In each space, the juxtaposition of the specter to the residents of Baishizhou highlighted the tenacious informality of the area. In one ecstatic image, the ‘control board specter’ walks in front of a temporary storage facility, which was constructed illegally on the rooftop of a condemned factory. In the foreground are discarded tyres and boxes, which have been organised for future re-use. In the background, just beyond the pastel tiles of Xintang are the high-end high-rise apartment buildings in neighbouring OCT.
Muzi’s colourful cape and formal poses arrested a gaze, but the wires and flickering lights of the props suggest the conditions of haunting Baishizhou. Like Zheng Kuai’s focus on Baishizhou’s wires, Specter takes reckoning with Baishizhou not only as a liminal space, but more precisely as a transient space. To live in Baishizhou is not necessarily to be from a rural area, but rather to be ruralised with respect to the city proper. The current residents do not simply live in the shadow of demolition and relocation, but rather the specter of demolition transvalues the work and lives of Baishizhou residents. They materialise suddenly and just as abruptly vanish into viscous uncertainty—apparitions like electricity, flickering across and between the neighbourhood’s dense network of wires. This article was originally published in Made in China, Vol. 3, No. 1, 2018. All Photos by the author. 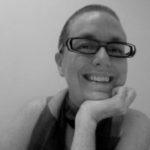 Mary Ann O’Donnell is an independent artist-ethnographer and co-founder of the Handshake 302 Art Space in Shenzhen. Since 2005, she has been blogging at Shenzhen Noted (https://shenzhennoted.com). With Winnie Wong and Jonathan Bach, she co-edited the volume Learning from Shenzhen (University of Chicago Press 2017).